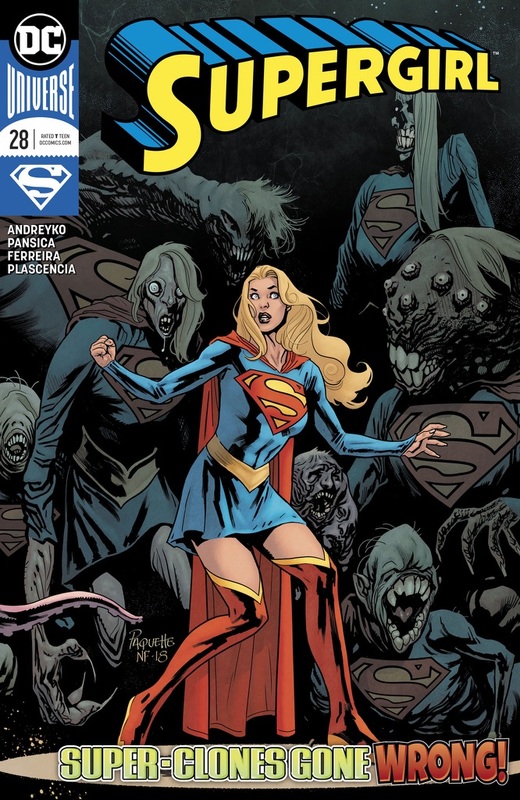 Stop me if you have heard this one before... A Supergirl walks into a bar... Just as the title suggests this issue continues Kara's search for answers to the claims Rogol Zaar made that he is the being responsible for the destruction of Krypton. Ambush Bug is getting booed off the stage when people notice the Kryptonian crest poking out from under Kara's cloak. When Kara asks if anyone knows anything about a Rogol Zaar they try and brush it off as if they have no clue. No one steps forward, so Kara says, "Tell me or I will make you tell me, either way works for me." Gandelo, is informed that Kara has been located and says he has an "Independent contractor at the ready" to deal with her. After some harsh words at the bar, a brawl breaks out. Krypto joins in the fray, but with Kara not being around Earth's yellow sun to recharge her powers she is soon overtaken by the crowd of patrons. A large creature raises his weapon and is about to put Kara down for good when Kara reveals the axe of Rogol Zaar and uses it defend herself. Immediately the crowd backs away from her and some even praise her as the "The Axe Queen". A creature is about to tell Kara what he knows when he is shot down by another. She finds another crystal like the one that was given to her last issue, and picks up a "traveling companion" named Z'ndr Kol who convinces her to take him off planet. As the ship travels through space, Kara gets really ill as they find themselves smack dab in the middle where Krypton once was. Kara's quest has taken her to where Krypton used to be, remnants of the planet are still floating around the area, putting both Kara and Krypto in lethal danger. Kara instructs Z'ndr to assist her in putting on a space suit shielding her from the lethal radiation. After securing Krypto in a suit as well Kara explores outside the ship were she is attacked by the caretaker of Krypton, a being known as Splyce. As the two battle, Kara's shielding from the radiation begins to wear off and she hallucinates about being back on Krypton as a little girl. During these hallucinations she learns that possibly her father had something to do with the destruction of her home world. The fighting continues when a bright light appears and both combatants disappear leaving Z'ndr and Krypto wondering where they went. Kara, having her lost her battle with Splyce last issue, finds herself prisoner of an Earthling named Harry Hokum, a "Space Nazi" as he was referred to. With her powers drained from lack of yellow sunshine, she is a helpless captive. Thinking Kara's blood might have some curing properties, Hokum decides not to kill her but to experiment on her. Splyce blasts Supergirl for being insubordinate with a solar power energy blast, just enough to give Supergirl a little super-boost, which she decides to save for a more opportune time. Thrown into a prison cell with other various aliens, it is here she decides to use her little boost of super strength to free all the prisoners and attempt an escape. She meets up with the Omega Men, who have their own vendetta against Hokum. Agreeing to help each other they are met by an army of Hokum's soldiers who are ordered to kill them all... except the Kryptonian. Aboard the Citadel Grand Warship, Kara is severely weakened after the poisoning. Despite the threat she is determined to fight Hokum and his creation Splyce alongside the Omega Men in order to protect the innocent. While the Girl of Steel fights on Z'ndr Kol tends to a weakened Krypto and listens to the angry musings of his adoptive mother. As Hokum watches in amusement, Kara resorts to a plasma rifle to battle the shape shifting Splyce. The creature has realized her Tamaranean powers could reenergize Supergirl and Hokum wonders if he can create an even stronger creature by splicing in Kryptonian DNA to his creature. The Omega Men secure an escape craft and load on survivors ready to escape into the Vega system but Kara watches in horror as Splyce murders a child trying to get away. 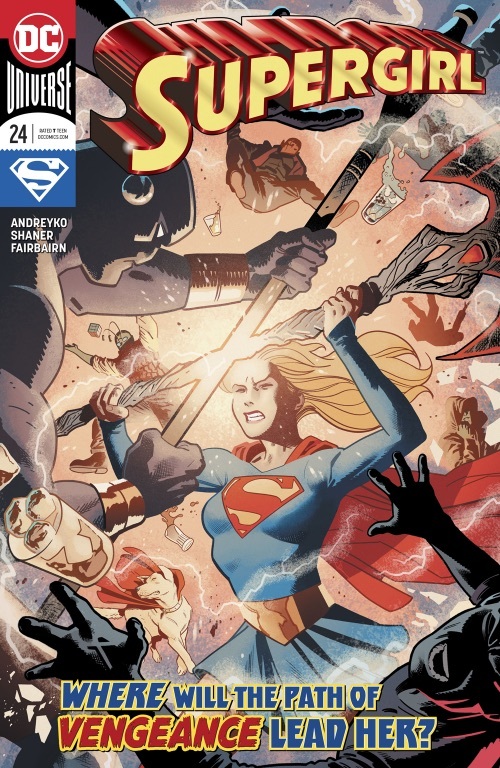 Despite her tearful anger Kara spares the life of her foe and escapes with the Omega Men. Z'ndr meanwhile has defied his mother for the last time. He sees something in Kara and Krypto that his mother clearly does not and by siding with a Kryptonian he endures a savage beating. Krypto, now fully healed, reawakens and rescues Z'ndr and they also escape in a craft. Kara watches their ship disappear while she tends to the survivors. She also notices a small scar on the neck of some of the Omega Men's friends but by the time she realizes the connection it's too late. They've been double crossed by genetic copies aboard their craft, and aboard the warship Hokum has succeeded in creating an army of warped Supergirl clones to wreak revenge. 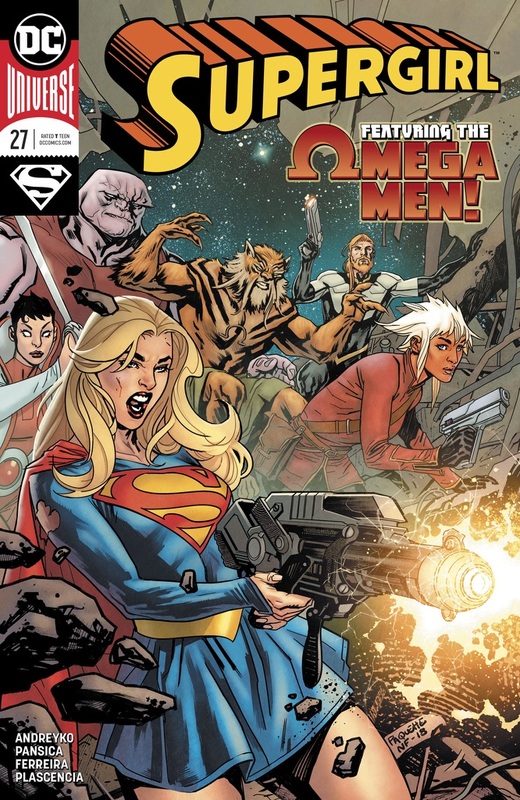 As the Omega Men and Supergirl battle the genetic clones. Kara tries to prevent them reaching the outpost using the axe she stole from Rogol Zaar despite knowing it amplifies rage. Ryand'r's solar power helps but the battle is a dangerous one. Even trying to reach out to her sisters doesn't seem to overcome their rage. Z'ndr and Krypto are soaring through space in the escape craft looking for signs of Kara and it's only by pure luck that Krypto notices a very weak signal on the video screen and the duo set a course to rejoin their friend. Back on the Omega Men's ship Kara asks Ryan'dr for a power boost and he obliges in his own unique way and the backlash causes their unstable genetics to collapse in literal piles of goo. Kara swears revenge and takes the fight directly to Hokum. Kara snatches Appa's ring as Hokum is teleported away to safety and investigated the ship making a horrific discovery. Kalista tells Kara that their friends that Hokum experimented on have survived but will remain in stasis until they can be cured. Ryand'r also gives Supergirl a parting gift - her superpowers at maximum strength just in time for Z'ndr and Krypto to reunite with them. Hokum finds himself at the mercy of Lord Gandelo who shows no mercy to the deranged scientist. Gandelo teleports Hokum into deep space and watches him suffocate. Gandelo holds a holo-conference with the Rannians and Thanagarians revealing that Supergirl knows the truth about The Circle. They insist Rogol Zaar has gone rogue but they all risk exposure if Supergirl reveals what she has seen. Gandelo sends an order to Rogol Zaar's planet, R'Venna, with an order to kill Kara Zor-El and the entire planet swears to continue Zaar's work. Kara, Z'ndr and Krypto have escaped to Planet Tavaar. The young Coluan reveals to Kara how he got his cybernetic arm as the three bond. When talk veers to Z'ndr's mother he struggles to hide his secret, luckily for the strained conversation, Krypto approaches with something he's dug up... one of Appa's memory crystals. After some digging, and Z'ndr also mysteriously possessing a piece, they have the entire set. Rogol Zaar's axe activates Appa's artificial intelligence and it in turn begins to spew out all the mysteries of The Circle. The purpose of The Circle was a noble one but one of its founders Empress Gandelo wanted to take control of it and use its power and influence to be a force for change rather than reactionary with Rogol Zaar as its tool. A personal vendetta led Zaar and Gandelo to betray The Circle and use technology stolen for Kara's father to take control of galaxy after galaxy. Appa tells Kara to take the crystals to Oa to end The Circle for good. As Zaar's followers arrive on Tavaar they begin attacking the heroes. 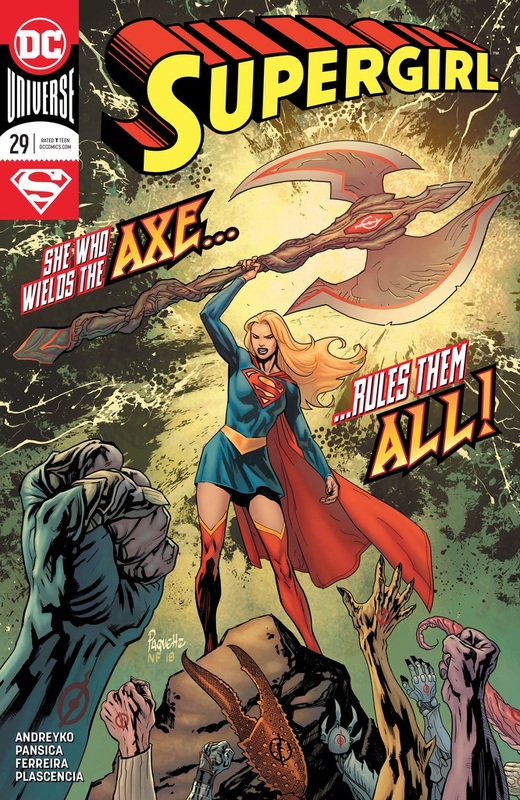 They leave destruction in their wake until Kara reveals her possession of the axe. 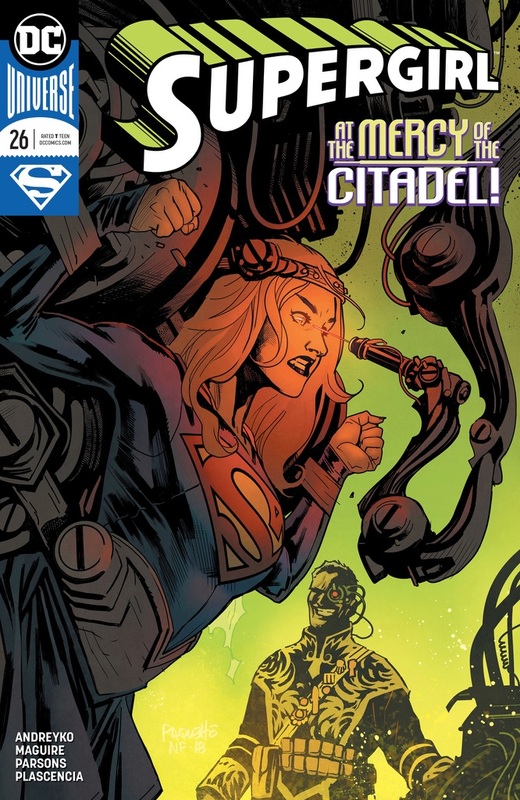 As the followers swear a new allegiance to Supergirl, Z'ndr's worst nightmare unfolds as his mother, Empress Gandelo appears with murder on her mind. 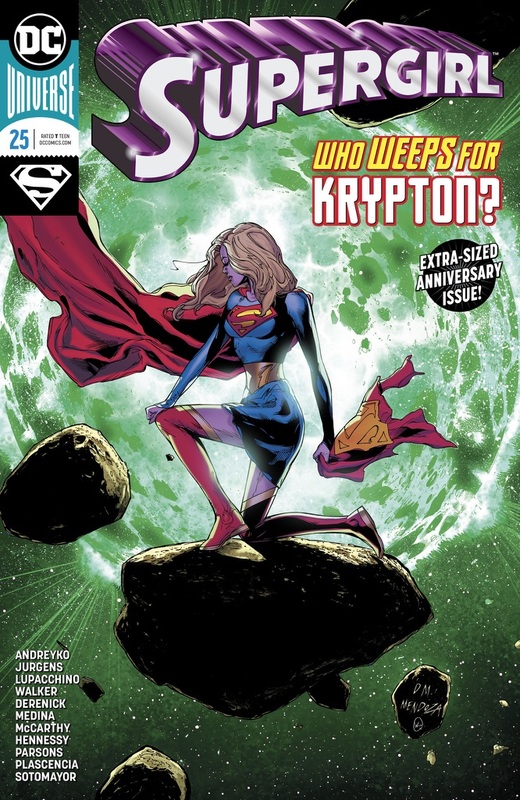 Here is a listing of the Supergirl monthly title since its Post-Rebirth relaunch in August 2016. The Writer, Penciller and Inker for each issue are listed within the Comic Book Index pages, directly below each title's name and number.